Greatway Services | Where Service Comes First. Period. Where Service Comes First. Period. 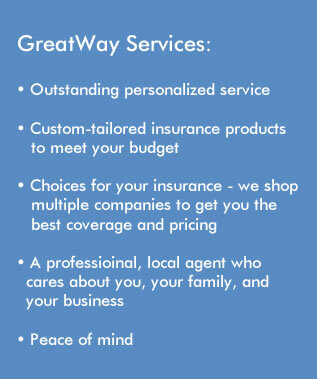 Located in Nixa, MO, GreatWay Services Co., LLC brings local personalized service to your insurance and title needs. The mission of GreatWay Services is to provide our customers with insurance products at competitive prices with personal, friendly and dependable service. As an Independent Agency, we shop to find you the best price with the best company to match your portfolio. All of our companies are “A” rated, meaning they have consistently proven their commitment to outstanding service as well as their financial solvency when you need it most. You can be confident with our stability and resources which protect you from the unexpected for the long haul. We offer insurance products needed in every facet of life which include; Home, Farm, Mobile Home, Auto, RV, Boat, Motorcycle, ATV, Business, General Liability, Workers Compensation, Professional Liability, Life, and Health Insurance and Senior Health Plans. In as little as five minutes we can provide you with a superior, competitive and comprehensive quote. Our independent insurance agents offer knowledgeable advice and guidance for all your insurance needs and you receive the piece of mind that only comes by shopping many companies at our “one stop shop”. Wonderful customer service and found us a great price on home and auto both! I found Greatway at a very difficult time in my life and they went above and beyond to help me every step of the way. I would recommend them to anyone. Great local company with unsurpassed service. I currently have auto insurance through this company and will be switching my homeowner’s insurance when the time comes. Highly recommended! Considering my age it was almost impossible to find the coverage I wanted and needed at a price I could afford. Luckily I heard about Greatway. I couldn’t ask for better! This is honestly the way to go, give them a call!